GMA Network, Inc. (GMA-7) ended the month of August on a positive note as it led rival stations in nationwide TV ratings according to data from the industry’s more trusted ratings source Nielsen TV Audience Measurement. Based on full August data (August 1 to 25 official data; August 26 to 31 overnight data), GMA registered an average of 34 percent in total day (6 AM to 12 MN) household audience shares in National Urban Philippines, 1.3 percentage points ahead of ABS-CBN’s 32.7, and 19.2 percentage points ahead of TV5’s 14.8. In comparison with the previous month, GMA was the only broadcast company whose total day household audience share across all areas (inclusive of the Visayas-Mindanao regions) increased in August, as driven by improved shares in the evening block (6 PM to 11 PM), where viewing levels are at their highest. Further, GMA remained undisputed and led all dayparts in the important areas of Urban Luzon and Mega Manila, which represent 77 and 59.5 percent of total urban television households in the country, respectively. In Urban Luzon, Nielsen data show that GMA hiked its total day household audience share compared to the previous month from 37.1 to 38 percent. ABS-CBN scored only 28.6 percent while TV5 lagged farther behind with 14.1 percent. GMA also maintained its solid performance in Mega Manila, even increasing its total day average from 37.9 percent in July to 39.1 percent in August. On the other hand, ABS-CBN managed 26.4 percent, while TV5 got only 14.9 percent. In the afternoon block (12 NN to 6 PM), GMA further strengthened its dominance, scoring double-digit margins in audience share over its closest competitor. GMA led ABS-CBN in the afternoon block by 13.9 points in NUTAM, 22.1 points in Urban Luzon, and 24.8 points in Mega Manila. Meanwhile, in the evening block, GMA almost doubled its audience share lead in Urban Luzon and Mega Manila over ABS-CBN relative to July. GMA’s margin over ABS-CBN widened from 1.6 to 4.1 points in Urban Luzon, and from 4.2 to 7.9 points in Mega Manila. In NUTAM, GMA increased its audience share by 2.2 points while ABS-CBN’s viewership level remained the same. GMA also dominated the list of top programs in Urban Luzon and Mega Manila. 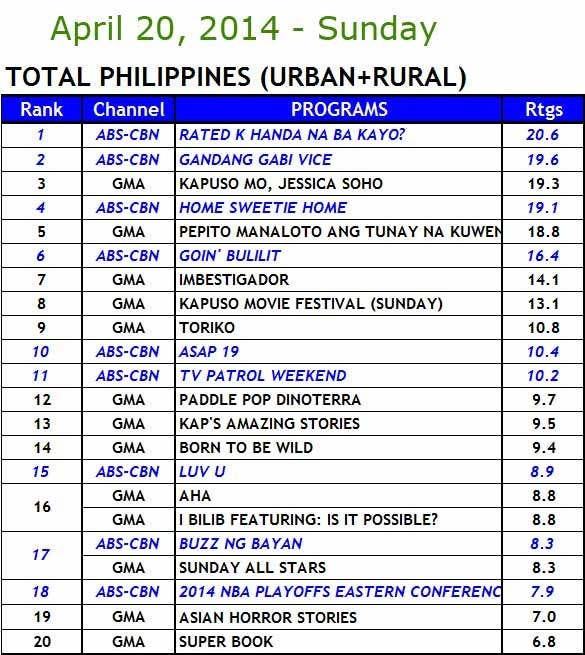 Twenty (20) Kapuso shows figured in the most watched program list in Urban Luzon. These include weekend top-rater Kapuso Mo, Jessica Soho, flagship primetime newscast 24 Oras, Richard Gutierrez-starrer Makapiling Kang Muli, Kapuso Movie Night, multi-generational drama Luna Blanca: Ang Ikalawang Yugto, the country’s number one noontime show Eat Bulaga, top-rating drama One True Love, public affairs show Wish Ko Lang, top-rating infotainment show Kap’s Amazing Stories, among others. There were also 20 GMA programs in the list of the 30 top programs in Mega Manila with Kapuso Mo, Jessica Soho topping the list. Other high-rating Kapuso shows in Mega Manila include 24 Oras, Makapiling Kang Muli, Kapuso Movie Night, Luna Blanca, Eat Bulaga, One True Love, Wish Ko Lang, and Imbestigador. The Nielsen TV Audience Measurement has a sample size of 1,190 homes in Mega Manila versus Kantar Media’s 770 homes. Nielsen also has a nationwide sample size of 2,000 homes compared to the lower sample size of 1,370 utilized by Kantar Media. GMA likewise remained to be the most profitable local broadcast company. GMA’s bottomline for the first half of the year settled at P1.014 billion at the back of improved advertising revenues. ABS-CBN, on the other hand, posted a lower net income of P927 million, down 45 percent compared to same financial period last year.